Greg Bradford shakes hands with District 1 Georgia House of Representatives candidate Colton Moore as the final numbers come in for the Georgia House District 1 election at the Dade County County Administrative Building Tuesday, May 22, 2018, in Trenton, Ga. Moore edged out incumbent John Deffenbaugh for the seat. This story was updated May 22, 2018, at 10:51 p.m. with more information. 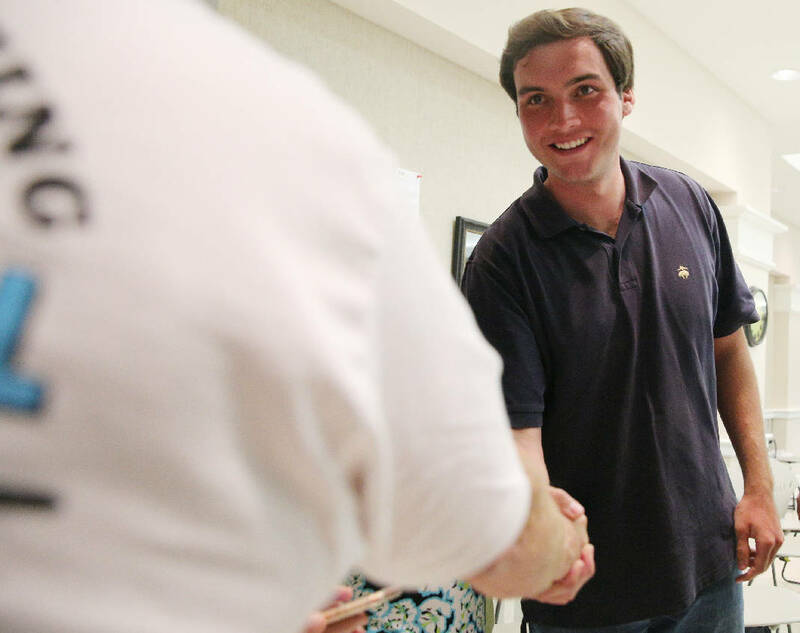 Carried by his hometown, 24-year-old Colton Moore will join the Georgia Legislature, according to unofficial election results. With all precincts reporting, Moore edged incumbent state Rep. John Deffenbaugh, R-Lookout Mountain, 2,184 votes to 1,858 in the state House District 1 Republican Primary on Tuesday. No Democrats are running in the race. "I don't think it's really sunk in yet," Moore said after seeing the results pour in around 10 p.m. "I still feel like I'm in campaign mode. I feel quite honored. It was essentially Dade County that carried me." 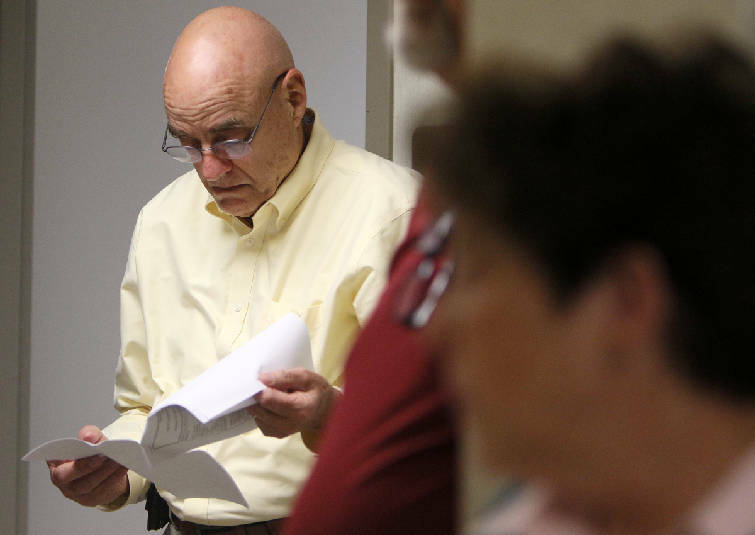 State Rep. John Deffenbaugh looks over results from one precinct as he waits for the outcome of the Georgia House District 1 election at the Dade County County Administrative Building Tuesday, May 22, 2018, in Trenton, Ga.
Moore, an auctioneer, was born and raised on Lookout Mountain with a large extended family. He doubled Deffenbaugh's votes in his home county, 1,436-721. Deffenbaugh beat him in Walker County, but not by enough: 1,137-748. Deffenbaugh did not immediately return a call seeking comment Tuesday night. Moore will take office in January, but he plans to begin work Wednesday. He said he has built a coalition with some local educators, and he wants to begin drafting bills this summer. Education reform was a plank of his campaign — in particular, doing away with some standardized tests. "We're looking for something that's going to be easy to pass, easy to get done," he said. "Not some 10,000-page bill." Deffenbaugh, 73, has lived on Lookout Mountain since enrolling at Covenant College in 1966. After he graduated, he sold industrial electronics, a job he still works at part time. He joined the Dade County Commission in 1997 but lost his re-election bid in 2000. After serving as the county's GOP chairman, he won a three-man race to join the legislature in 2012. Since then, he has passed only one bill, which added a 16th member to the board of public safety. He told the Times Free Press earlier this year that he leaves his mark quietly, helping constituents solve problems when they intersect with the government. He has more cachet with the folks in Atlanta. "I get answers quicker," he said in March. "There's no reason why that should be so. But it is. I've been able to help a lot of people, just with minor things." There is a benefit to his approach. When you don't make news, people assume the best. "I've never heard anything negative about him, so I'm just hoping that's a good thing," Beverly Heming said after casting a vote for Deffenbaugh in the Chattanooga Valley precinct Tuesday morning. "I think he deserves another term," said Larry Robinson, in the Rossville precinct. "I haven't heard anything bad about him." Tuesday's results mark a sharp contrast from Deffenbaugh's election to state office. In a runoff in 2012, Dade County voters carried him. He got 55 percent of the vote there, compared to 39 percent in Walker County. But by 2014, when he faced another runoff in a Republican primary, Deffenbaugh's popularity had shifted. He lost all but one precinct in Dade County, but he swept the precincts in Walker County. Some voters at the Trenton precinct said they felt Deffenbaugh didn't represent them enough. "Deffenbaugh just never has seemed like he was from Dade County," Larry Case said. "He politics very little over here. I've known him for a long time. But he just, he doesn't have a lot of time for Dade County. "We often get kind of left out from Walker County," said Jonathan Page, who taught Moore's middle school social studies class. "Deffenbaugh's not done anything to support our county." Moore ran as a change agent, promising to infuse energy into politics from the northwest corner of the state. His greatest priority was criminal justice reform, a product of the prosecution against his father in a marijuana distribution case 22 years ago. He said Tuesday that he plans to fly to Texas this year, where he can study conviction integrity units. These are groups of attorneys, hired by local prosecutors, to review old cases and look for evidence that may exonerate some convicted defendants. He also plans to visit state Speaker of the House David Ralston and the remaining governor candidates in the state, as well as the chairpersons of several committees in the legislature. He wants to build connections as quickly as possible. "I'm setting up [today] as many meetings as I can," he said.